A Charleston Wedding Photographer takes pictures in a city that is both charming and historical. Charleston is the oldest city in South Carolina. The city is known for its rich history, well-preserved architecture, scrumptious restaurants, and friendly locals. As a Charleston Photographer I know that it is important to capture every moment and detail that makes a wedding a uniquely magical event. 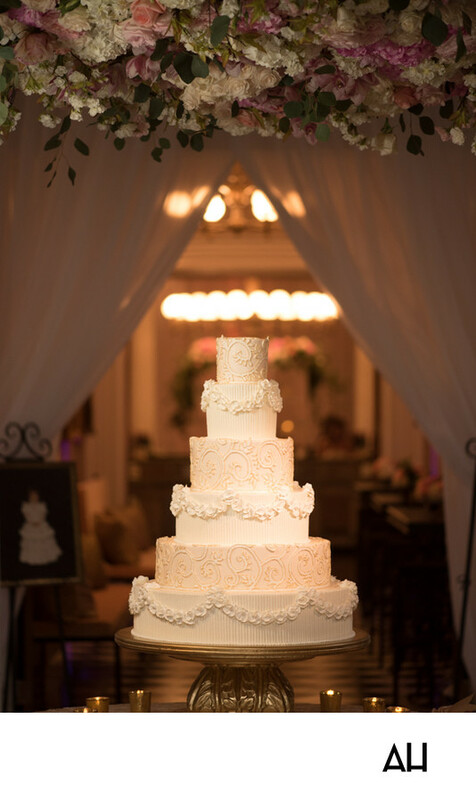 This picture from a lovely Charleston wedding displays the wedding cake as the focus of the image. The cake is magnificent, with six tiers of delicious vanilla cake and icing. Designs of ruffles and flowers line each tier, making the cake look more like a work of art than a desert to be eaten. The cake is placed on top of a gold painted pedestal, with assorted flora hanging overhead. The flowers flow across the top of the picture in shades of white and pink, with delicate green leaves. The cake is framed by sheer white curtains, that part at the entrance of the room. On either side of the entrance also is a framed picture. On the left side of the image, is a photograph of the bride as a young girl, wearing a fancy white dress. On the right side, and not captured within the lens of the camera, is a similar image of the groom as a young boy. Beyond the room light glow on the ceilings and walls of the venue and give the space an enchanting glow. It is an incredibly elegant setting, with touches of Southern charm that one would expect to find at a Charleston celebration.